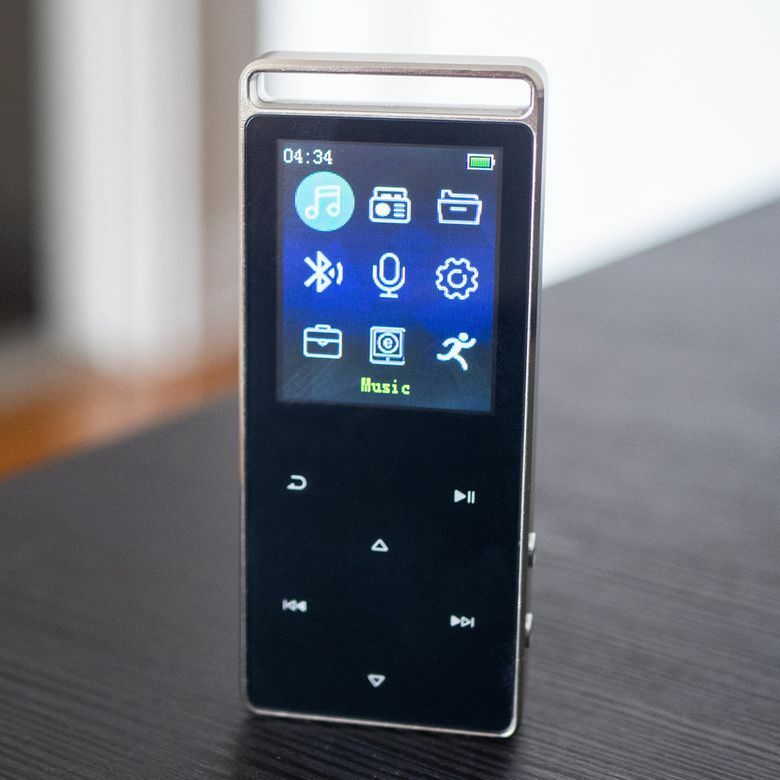 The A01T from AGPTEK is a budget MP3 player that checks a lot of boxes but doesn’t come with the best file type compatibility and requires a bit of a learning curve. In a crowded lineup of nearly identical AGPTEK MP3 players, the A01T might just be the ideal choice for those who want reliability, functionality and affordability. Averaging just around $36, you get a surprising number of additional features for an MP3 player, many of which aren’t even found on the more expensive options out there. The capacitive touch panel takes a bit of getting used to, and the screen itself leaves a lot to be desired, but on a raw MP3 playback level, this player does the job in a sturdy form factor at a stomachable price. The A01T measures just over 5.5 x 3.5 inches when looking at the front, and sits under 2 inches thick. That makes it a really sleek, simple and small device on the design front. The front is built fully of glass, the bottom half is a series of capacitive touch buttons sitting flush with the screen that occupies the top half. The 0.8-inch TFT screen is pretty small, even for this size of the device, and the resolution is really grainy and dated. It’s unfortunate because when the screen is off, the look of the device is pretty pleasing. The edges and back are built of a brushed aluminum material that is rough to the touch and actually has a slightly warm copper tone to it. On top, there is a rectangular loop that acts as a hook, which is our favorite design feature of the device because it makes it easy to hook it to a keychain or lanyard. We scoured as many marketing materials as we could find to figure out what the DAC was with this player, and AGPTEK just isn’t advertising it. That leads us to believe there really isn’t a standout amp built into the device, so if you’re looking for something that provides power and volume to high impedance headphones, we recommend picking up a dedicated DAC in addition to this media player. Where this device really does give you some flexibility is in the audio files it supports. Its chipset gives you the ability to play a library of files containing MP3, WMA, AAC, WAV, and even the better-liked compressed FLAC files. If your library has high-definition, lossless files that fit the above formats, it really will sound great. But, this device does not support the Apple-centric file types like m4a and AIFF, which gives it a ding in our book as you lose some pretty wide versatility on those omissions alone. Beyond this, in our testing, the sound quality was perfectly adequate for all the audio types, and we found that it has a pretty surprising amount of volume headroom for the size. This device does not support Apple-centric file types like m4a and AIFF. There is a 420 mAh lithium battery installed in this device, and AGPTEK clocks the battery life on this at about 45 hours of music playback. Those numbers are, on their own, pretty impressive when you consider more expensive MP3 players offer just about the same. What was disappointing about the battery life was that it only really lasted us around 30 hours with average day-to-day use. This included plenty of screen on time as we were navigating the menus, and we think this is largely due to the extra power required to light up the capacitive touch buttons (they flash a bright red to show you you’ve interacted with them). Thirty hours may not seem like the worst, but it’s disappointing to see the hour total clock in at so much less than what was advertised. What is refreshing, is we were able to charge up the device in well under 1 hour (AGPTEK states that it’ll take you up to an hour and a half to get to full juice). Finally, the onboard storage of 8GB is on the lower end, not quite as impressive as the A01S series’ 16GB. You can throw in a MicroSD card up to 128GB, and this should get you plenty of headroom, but it is something to keep in mind if you have a big library of high definition music. One of the most impressive qualities of this MP3 player is its build quality. In fact, we were able to test a Sony Walkman option that cost 10 times the price, and were far more impressed with the solid build quality of the A01T. This is mostly due to the weighty, solid aluminum construction and the ridged hook on the top. They don’t even have a flimsy lid over the microSD slot, which gives it less of weakness on the side. Because the aluminum is textured on the back, we did notice it was slightly more scratchable, but it was also more difficult to drop. Finally, the panel of glass on the front does seem like it could be a bit of an issue if you are prone to dropping your devices. We recommend keeping this in a case to avoid scratching it in your bag. One of the most impressive qualities of this MP3 player is its build quality. Because you navigate the MP3 player with a flat, glass-covered panel of capacitive touch buttons, you have to be looking down at the device to change tracks or pause/play music. What’s more is that we found the menu navigation to be both laggy and, because of the small screen, difficult to wrap your head around. Our recommendation is to jump right into the folder menus rather than trying to let the MP3 player organize your music automatically. The device is easy to use when it comes to transferring files (it works just like plugging in a USB flash drive to your computer), but that means you’re also at the mercy for how AGPTEK wants to parse the metadata on your music — hence our recommendation to navigate via folders. There are a few positives on the UX front, First, to avert some of the clunky menu systems, there are some shortcut buttons on the side, including a wake/sleep toggle, a lock switch and even a shortcut to record voice memos, making it easy to quickly record notes. There’s an included pedometer that will count your steps, there’s Bluetooth 4.0 capability for wireless headphones, and AGPTEK even includes an armband in the package here. This all leads us to believe that the best use case for this player is those looking for an on-the-go, workout device. Because it’s so sturdy, and it’ll work best if you start a playlist and let it go, this is for the gym goers more than it is for the audiophiles. When you’re talking about a device that averages around $30 at most retailers, it’s hard to hold it to as high a standard as something that costs in the hundreds. Honestly, even if you use this device to just transfer files between computers like a flash drive, it might be worth the money. That said, it isn’t even the least expensive option from AGPTEK, so we do find it surprising that it doesn’t have even a slightly brighter, better-looking display. But with the inclusion of an armband and some basic earbuds, we’re going to file the price in the pro column. AGPTEK A01S/ST: AGPTEK's A01 line has a few options, the A01 doesn’t offer Bluetooth but is still 8GB, while the A01S/ST both offer 16GB, with Bluetooth present in only the T version. FiiO m3K: The FiiO m3K provides you much better audio performance from the built-in DAC, and there’s more compatibility in file types, but you’ll also pay more than double the price. Sony NW-A35: The Sony NW-A35 is over $200 but gives you a much easier-to-use interface and better file compatibility for that steep premium. Read more reviews of the best budget MP3 players available to purchase online. A great lossless MP3 for the gym, with some caveats. If your high-definition music library has mostly WAV files, then the A01T will be a great lossless player for you, but we found it a little misleading for AGPTEK to call this a lossless player when it doesn’t even support AIFFs — arguably just as popular of a lossless format as WAV files. But if you’re looking for something you can load up with your MP3s and take it to the gym, leaving your smartphone at home, the build quality and convenience of this device fit that use case perfectly. Product Dimensions 1.6 x 3.5 x 0.4 in.